I can't believe it has been two weeks since my last post. We left the property for a trip up north and things have been a bit crazy. The title of this post probably led you to believe that we were stranded off-grid with no Internet, but that is not the case. We are still away from the property and living 'on the grid', but I did not turn my computer on from Wednesday night, July 18th until Monday morning July 23rd. 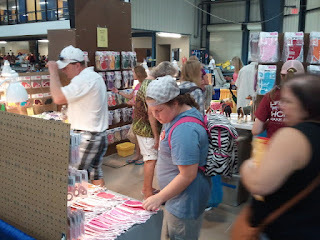 Every year we spend a long weekend in July helping one of our daughters at a sales event she attends in Lexington, Kentucky. 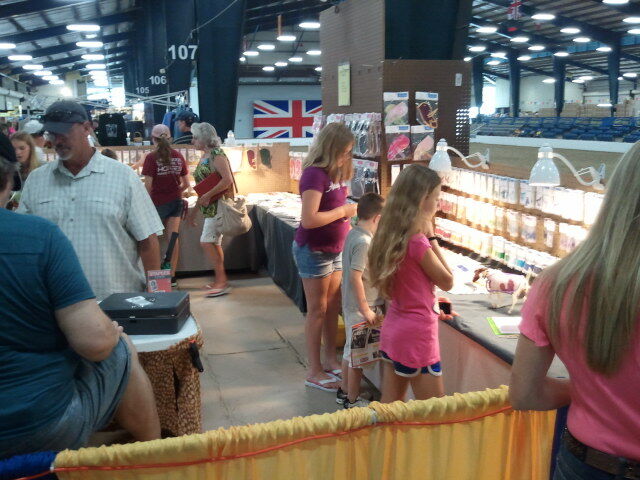 She has had a booth at BreyerFest at the Kentucky Horse Park for the past five years. Every year she has doubled the stock she takes and every year she sells out of almost everything. It is a very successful event for her. This year, she was due to have a baby a week after the event, so Alan and I volunteered to go without her and just the two of us man the booth. Last year she expanded to a double booth since the business has expanded so much, so this year Alan and I had to build and stock the display and run the sale. We always enjoy doing this, but this year's attendance was larger than ever. Even though we had twice the stock as last year, it was once again a sell out year! people at the check out. Many attenders come each year and have learned that our booth sells out of 'all the good stuff' quickly, so Friday morning (the first day of the event) the booth fills up quickly. 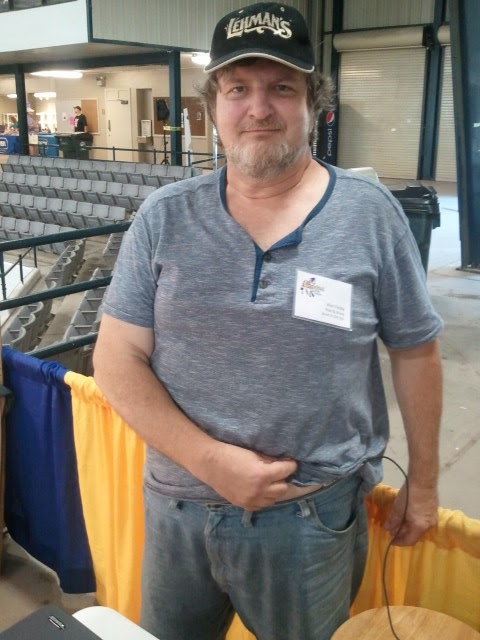 The vendor area opened at 9 AM, Alan manned the cash register and he did not have a point where no one was waiting to check out until about 2:30 in the afternoon and that was for less than 5 minutes before the line once again grew. I spent much of my time trying to keep those in line to stay away from the merchandise displays so that others could still shop. At close of day Friday, we breathed a huge sigh of relief and started discussing what we could due to improve traffic flow through the booth the next day. Creating the check out lane Saturday morning. First, we employed a little ingenuity to help with crowd control in the check out line. 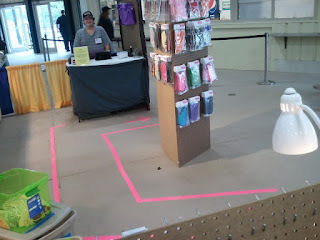 I had an idea to make a 'check-out-lane' using bright pink duct tape. We took down one small display table so that the aisle could be located away from all the display tables. Alan was dubious that people would stay within the 'lane' while waiting to pay, but it worked! 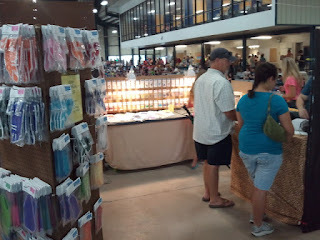 On Saturday, everyone waiting to pay stayed within the pink duct tape 'barrier' and as the line grew, they stretched past the end of it, down the hallway towards the next booth. Now shoppers had room to browse all the displays without trying to squeeze between those waiting to pay. Second, Alan came up with a 'MacGyver' solution to aid the check out process. As it was, we had vastly improved the speed of the check out process this year. 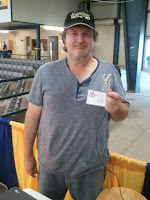 The product tags were bar coded for the first time, and Alan set up his Android tablet with a cash register program called 'Regisdroid' and used the camera on the tablet to scan the bar codes. Not only was it faster than the standard cash register we had used last year, it also provided more detailed end-of-day reports. For credit card sales we once again used Square on an Android phone, and this year we added a wireless receipt printer to the system since we no longer had the normal cash register receipt. However, both Friday and Saturday Alan noticed the touch screen response on the tablet becoming slower and slower. And then, for some unknown reason it would 'fix' itself, respond quickly for a while and then deteriorate once again. It seemed that standing up and 'grounding' himself would help for a while, but the problem always returned. Part way through Saturday he realized that it was the fact that he held onto the tablet while standing up that was 'fixing' the problem. Throughout the day, the table was resting on an case that held it at a convenient angle to use the stylus with and was 'hands-free'. However, this hand-free solution was the downfall. Overtime, the table could not detect the difference of when the stylus was touching it or not (think of it like the tablet was building up a static charge). Whenever Alan made contact with the tablet, it reset the 'charge' so that the tablet could once again detect the stylus. Alan's solution - plug a USB connector into the tablet, wrap the other end in aluminum foild and 'plug' it into his shorts so there is always a skin connection to ground the tablet. Oh, we also kept our MiFi internet unit we use on the property close at hand in case the cell signal at the facility failed. We did end up turning it on a few times when the cell deteriorated to the point of slowing down credit card transactions. We needed all the help we could get in speeding up the check-out line. At end-of-day Friday, I checked the sales report and there had been 347 transactions from 9AM to 5 PM. That is 44.6 transactions an hour! So, even though there was a constant line, we were certainly moving them through quickly. 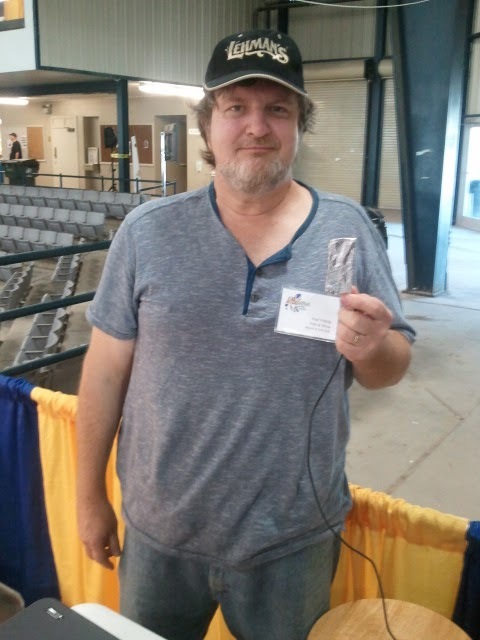 We received many comments and inquiries regarding our 'hi-tech' set up at a remote vendor site (inside a horse arena). We are already planning on having two check outs next year. So, what does that long story have to do with not having internet for 4+ days? I was so busy with the event, and packaging additional product each night, I never turned on my computer. Thursday night I am sitting in the hotel exhausted after staying up Wednesday night to help my daughter finish packaging more product, sleeping in the truck while Alan drove us to Kentucky and then setting up the booth once we arrived. I haven't checked email in almost 24 hours, which is almost unheard of. However, I convinced myself that if I turned the computer on, I would be up half the night and I really needed sleep so I could get up early and finish stocking the booth Friday morning before the sale started. If my customers have an urgent need they can always reach me by phone, which I am constantly checking for messages since my daughter is due to have a baby in a week. Friday night I am sitting in the hotel room packaging up more product to restock the displays on Saturday and I am mentally arguing with myself about if I needed to set up the computer and check my email. This time I convince myself that it is now the weekend and if I do have emails to answer my customers will not expect me to respond until Monday. But I am fretting that I will never be able to get caught up on reading friends' Facebook status' from the past few days, how many days does Facebook allow you to scroll back through?!? Saturday night I am once again trying to add more product to the depleted stock while Alan checks his email and Facebook account. As I am working he says ' It sounds like something has happened in Colorado. Several of my Facebook friends have status updates saying they are praying for Aurora, Colorado.' He then checks headline news and we learn the whole story -- almost 24 hours after it happened. Later, this 'no internet for several days' made me start to realize that we have become so accustomed to instant updates that we do not stop to realize that the fact we do not know something right away is not earth-shattering. The fact that we did not hear about the Aurora tragedy for almost 24 hours did not effect anything one iota. The fact I did not respond to client emails over the weekend did not effect the work I was doing on their accounts. The fact I missed some of the Facebook 'posters' my friends incessantly 'share' was not earth-shattering. By the way, we are still waiting on that grandbaby to make her grand appearance! We can flush without carrying water! Well, it's been almost a week since my last post and that can only mean one thing - we are back up North. We left the property last Thursday and will be not be going back to it until about the second week of August. When to do head back down, we should be able to stay there several months, until almost Thanksgiving. We arrived back up North in time to celebrate our grandson's first birthday and we will be staying here until after our granddaughter is born. when he comes to visit. He sure enjoyed the sticks and dirt at the park. We did have a flurry of projects before we left the property, which seems to be the norm as we consider what we want to have in place while we are gone. Our biggest accomplishments included adding more lighting inside the house and some plumbing. Alan braved a trip up into the attic and discovered he could maneuver over to various ceiling light fixtures without too much difficulty. Over several mornings he ran wiring to the laundry room (work room) ceiling light and then the kitchen and one of the living room ceiling fixtures. He only worked on these in the morning because by 11 AM it was much to hot up there to work, as it was he would change he shirt about four times each morning he worked up there as they would be dripping wet each time he came down the ladder to work on the fixtures. We used some of the existing fixtures but we replaced the ones that enclosed the light bulbs because the 12V LED bulbs we are using, while designed to fit normal light sockets, are sensitive to heat and should not be enclosed. We can now use light switches to turn on lights in the laundry room, kitchen, living room and our bedroom. There is also a wall lamp in the living room that switches on at the lamp and also lights on either side of the bathroom mirror that operate by pull chain. I was a bit worried that with the ability to use all these lights we could also easily exhaust our batteries. But so far, we have been able to use them every night and also charge phones, e-readers and computers without having the charge controller cut off the power, as will happen if the battery charge gets too low. I still occasionally forget to turn off a light as a leave the room, but I am working on it. We also now have 'running water' to the toilet, well maybe more like 'jogging water'. We were so pleased by how much water we caught during our brief rain storm simply by setting plastic storage containers under the eaves on the deck, that we decided to set up a water catch basin outside the bathroom window and pipe it into the toilet. We bought a 100 gallon plastic trough at a local farm store, covered it with screening to keep out twigs, leaves, etc. and ran pipe from the trough up into the bathroom next to the toilet. Inside the bathroom we mounted one of our Guzzler hand pumps onto the wall, connected the piping to it and extended piping from the other end of the pump into the toilet tank and voilà no more carrying bottles of water to the toilet. We used the water we had caught in the containers to partially fill the trough and we were set. You may recall we built steps up to the deck at the start of this trip. That and the fact that we had also repaired the sliding glass door (and screen) led to one other project we completed before we left. One night, several days before we were leaving, I was laying in bed, dozing off, when a heard a very loud "mrrooww". A very throaty cat sound that had to be bigger than a house cat. My first thought was 'That's cool". My second thought was "There are now steps up to the deck that animals could climb up, including whatever I just heard" and my third thought was "...and it is so hot tonight we left the sliding glass door open so there is only a screen door between the deck and the office next to our bedroom". The next day we went out and got a chain link gate that we could install at the top of the deck stairs. to go for ferris wheel rides. We are not heading back up north for a few more days, but for our remaining time here on this trip, we are limiting work projects to those that we have materials on hand for as we have exhausted our project budget for this trip. Hopefully, when we check the mail on our return to the 'old house' we will have some client payments waiting to refill the coffers for the next trip down. 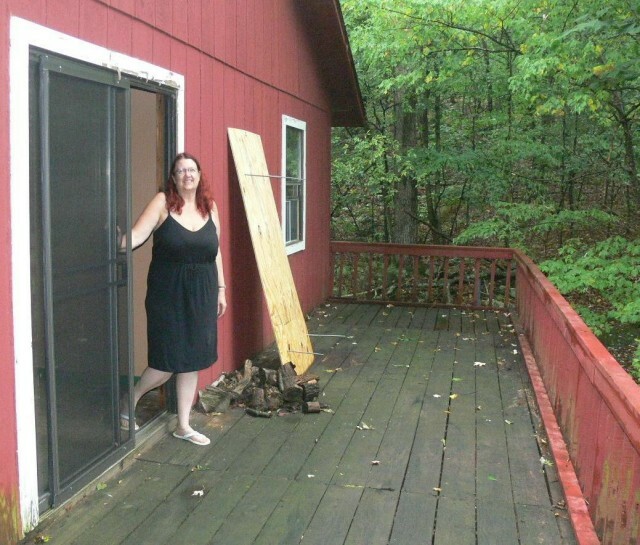 It is a blessing that we can have a mix of working on the property and working at our jobs while we are down here so we continue to have an income to pay for our adventure :-) Of course, that was the point of this new life style, to still be able to work at our high-tech jobs while living off grid. There were a few rough days on the first trip down when we closed on the property back in march, mainly with poor phone connections, but the occupational work aspect has gone very well on this trip. The only real issue we had this time was that we discovered that mental work is much harder than physical work in the extreme heat. Our solution has been to visit area wi-fi spots if we have extensive programming to do on very hot days. But that is really no different than when we are up north as we sometimes hang out at the same types of places for a change of scenery from working at home all the time. Well, despite my above ramblings, this post has nothing to do with any of our projects, there will be another update on those in a day or two. This post has been in process since we first came down here. I have been trying to keep track of the interesting critters we come across. The good news is we have not seen any snakes yet, the bad news is we have seen a variety of spiders and I hate spiders more than snakes. Years ago (before kids) I would run out of a room if I saw a spider. Over the years this fear has mellowed and 'normal' spiders do not really bother me. However, I was told there were brown recluse spiders in the area we are moving to and so I was a bit paranoid on our first stay at the house. It did not help that the first time I stepped into the bathroom there was a huge wolf spider on the wall next to the toilet. I reverted to my old arachnophobia habits and ran out of the room and had Alan kill it. I later checked it out through Google to determine what kind of spider it was and discovered the one that greeted us was actual about medium sized as wolf spiders go. These are usually found more in southwest desert areas so hopefully they are not prevalent in the Ozarks. According to a website on "Common House Spiders in Missouri" there are 'occasional sightings inside rural homes'. I hope that instance fulfills our 'occasional sighting' for a long time. I may as well cover the other spider pictures and get the creepy-crawly portion over with. We noticed several thin, leggy spiders about the size of a quarter around the house. One morning there was one in the utility tub trying unsuccessfully to climb up the sides to get out. I was able to get a picture and did some research. It is a grass spider that is very common in the area and harmless. They make funnel webs outside near the ground. After reading this, I started noticing many such webs along the road side. When we started spotting them we picked up another common product down here - spider spray, and sprayed around our windows and doors which has helped a lot. I have not seen a grass spider inside the house for several days now. One last spider that is not really a spider - daddy long legs. Their actual common name is harvestmen and they are harmless, but they grow 'em big down here, often over 5-6 inches long. And they grow A LOT of them down here. Again the spider spray has helped keep them outside the house. One day we stepped out on the deck and there were probably a couple dozen all bunched together, not moving. I am not sure what's up with that, but it creeps you out when you see it. Over the last two weeks, just around the house, we have seen hundreds of them. but creepy when the bunch together. Now for some more fun & interesting insects. 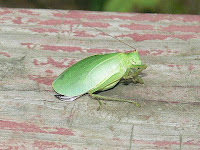 First, one of our Katydids. Growing up, I remember hearing these at night in ones and twos, calling each other 'Katydid!'. But down here, you can never hear just one or two, you can never make out the 'Katydid' sound. As I mentioned a few weeks ago, these little guys start up around dusk, way up in the trees, and there must be thousands of them. It is a constant shrill noise, which Alan measured at just under 70 dB. They keep it up all night until they stop to rest at dawn. Last Monday, while doing the laundry, I was looking out the window and saw I had a guest watching me from the screen. I had first though it was just a little twig stuck to the screen, but then I noticed it was an insect. On closer inspection, I saw it was the tiniest praying mantis I have every seen, not that I have seen many. According to my Google results it is a baby praying mantis. Smaller than a penny. 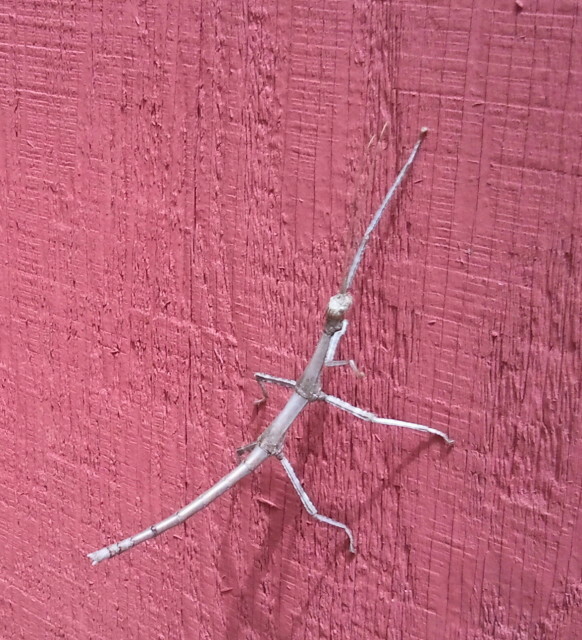 On our first trip I saw a walking stick on the side of our house (pictured to the right). 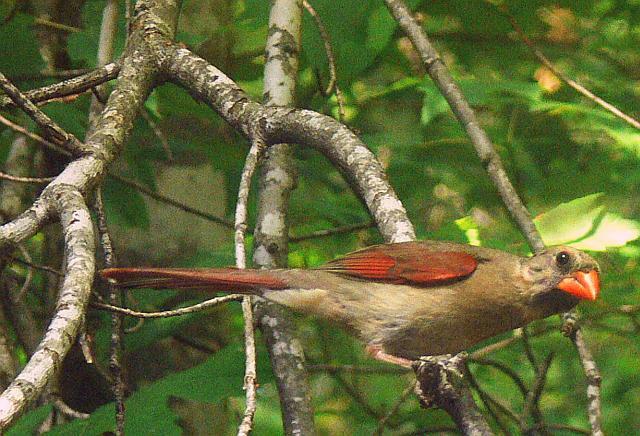 I have since then seen several others , one was on the outside of our bedroom window this morning. The most interesting so far hve been the ones pictured below. I took the first picture below left after climbing up on the roof to fix the chimney, I thought it was a rare glimpse of 'nature' so I googled 'male and female walking sticks' and learned "Males are very rare, with less than 1 in a 1000 being male. Females are parthenogenetic, though, so they do not need males to reproduce, but if the eggs are not fertilized by a male, they are technically just clones of the original insect." My question is, if males are so rare, why did I walk out on the other end of our deck the next day and get the second picture below? 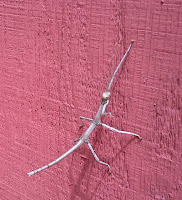 Maybe our property is the honeymoon destination for walking sticks. 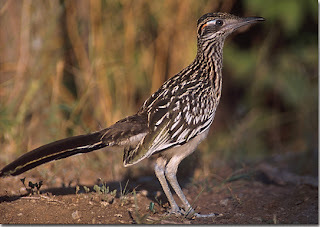 I was excited to see a roadrunner. smaller - about the size of a ring-neck pheasant. 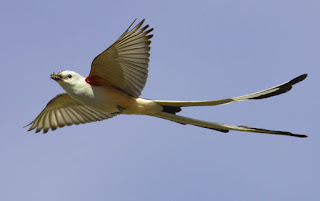 This is a Scissortail Flycatcher. We also have another pair of birds, not so interesting because of their species, but because of their antics. 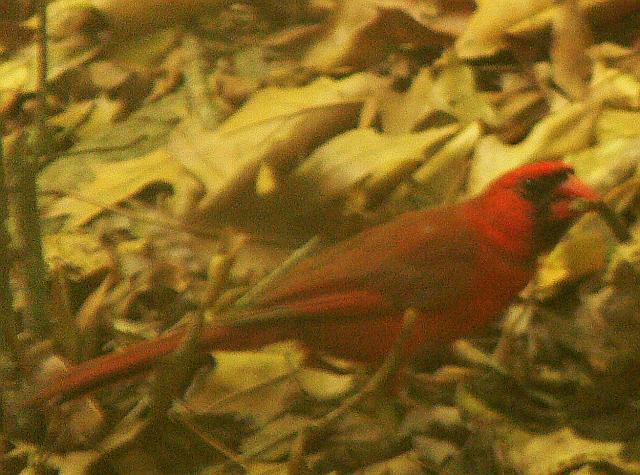 These are a pair of basic Cardinals, who wake us each and every morning by their attempts to get into the house. They start early in the morning in the back of the house, usually at the bathroom, and repeatedly slam themselves into the window. So far we have only seen the female do this, and she is persistent, flying into the window over and over for a half hour or better, each and every day. This is on the west side of the house, so there are no reflections etc. on the glass, so we have no idea what causes them to do this. But it is entertaining. 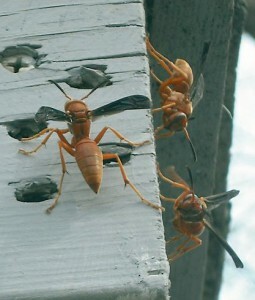 And one last nasty critter that Alan has become quite familiar with - red wasps. We discovered these in our shed next to the house. Apparently, in the past these were considered non-aggressive wasps. In fact one article I read stated this, but then re-canted the statement because so many people contacted them describing how aggressive they found them to be. The writer of the article said they used to be non-aggressive but there seems to be a new strain that has been becoming more predominant over the last few years. But Alan is winning the battle. He says the score so far is wasps-1: Alan - about 30. The wasps got in one sting during one of the 'skirmishes' and it did seem to swell more than a normal wasp sting. But we kept the Benedryl close by and watched for any adverse reactions for a few hours. Since then he has been spraying inside the shed and the war is almost over. of one of these colorful little skinks. One last photo because I was finally able to get a picture of a little guy that occasionally appears on our deck, but is very shy. I was calling him a blue-tailed skink, but it is actually a five-lined skink. We have also seen the more common, and larger ground skinks around the yard, but this little guy is smaller (about 3 inches long) and much more colorful. We had just come back from the swimmin' hole and had our damp clothes hanging over the deck railing and this little guy got brave enough to come explore around them. Well, it's been a while since my last blog post. Alan and I have both had work projects and, while we are able to do physical work in this heat, we have found it is much harder to do the mental work involved in our jobs. So, we have spent several days this week at the 'local' Panera and Atlanta Bread restaraunts. Our internet at the property is working great, but when it comes to concentrating on programming, I find it hard to do while sweating. Progress on the house has been slower this week because we have been putting in longer hours at work, but there has been progress everyday. Let's see if I can remember what we have accomplished since my last post. Wednesday, the 4th of July, we awoke early to go to Harbor Freight because we had a 25% off coupon for any item that day. It seems Harbor Freight has become our holiday destination because we also went to one on Memorial Day with a similar coupon. 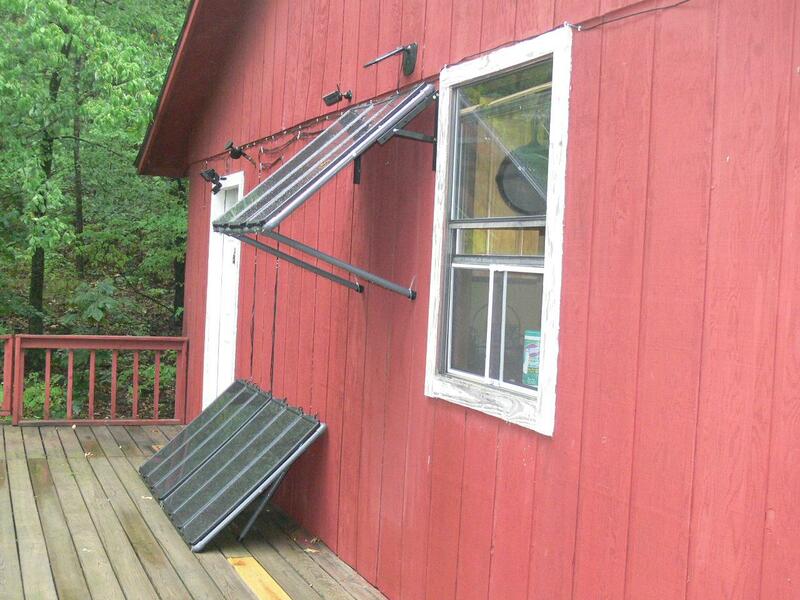 We purchased another set of three solar panels. These sets are normally about $229, but they were marked down to $189 plus we were able to use our 25% off coupon on top of the sale price. While we were out, we stopped for lunch at a local steakhouse which offers steaks and a buffet. 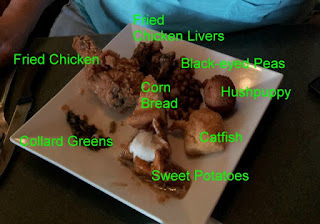 We had the buffet for lunch and I embraced southern living with the choices I put on my plate - fried chicken, black-eyed peas, fried chicken livers, hushpuppy, catfish, sweet potato cassserole, corn bread and collard greens. It was the first time I have had black-eyed peas and collard green and I liked both. The fact they were both cooked with bacon probably helped. When we returned home we added the new panels into the array, but it was too dark by then to see how they effected the charging process. Thursday we spent the day working at Atlanta Bread Company, we left fairly early in the morning, but there was already a small charge coming from the solar panel array. Unfortunately, we worked until evening so we did not get the pleasure on checking the charge controller readout throughout the day. The old 'sliding glass door'. It did not slide and was not glass. When we started the project, we decided it would be easier to go up to the roof from the north side of the house. The deck wraps around there but we have not accessed it until today because the deck at the front (east) of the house on that side (past the French doors) is completely rotted through. 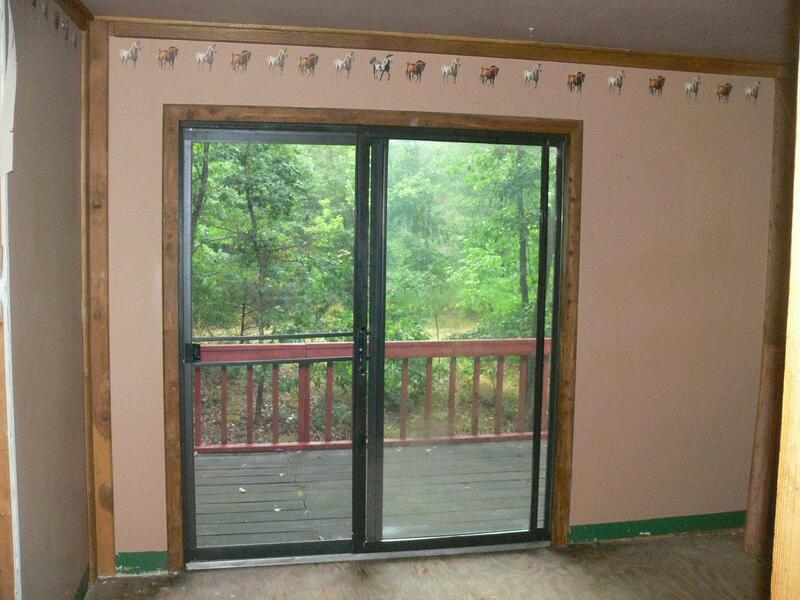 And, the sliding glass door that leads to the deck on the north side is where the house had previously been broken into and the glass on one of the sliding doors had been shattered. 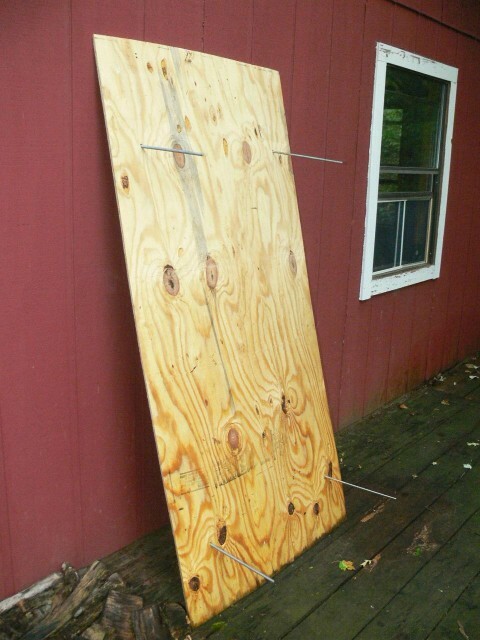 The 'repair' made before we bought the place consisted of a sheet of plywood, threaded steel rods and long 2x4s all bolted together to cover the empty sliding door frame. We removed the plywood to put the ladder on that part of the deck as it was closest to the chimney. When we were done we decided to see what was involved in removing the door that was missing glass to get it repaired or replaced. It actually came out quite easily and we found a business that could replace the glass that day. We cleaned off the north deck which was littered with leaves and branches and then loaded the door frame into Truck and headed to town. Since the repair would take a while, we headed to the Panera in the same town to work for a while. We also stopped at a Lowes for a screen panel for the sliding door and I had a great find with Oops' paint - a gallon of interior cream colored paint ($5), a gallon of deck stain ($5) that is almost an exact match to a previous Oops gallon I picked up and a gallon of dark red exterior gloss ($7) that will look great on the outside door to the laundry room which really needs painted. There was also a 5 gallon bucket of pink interior paint but I passed on that one, I do have limits on what I will buy at a bargain price and pink paint is one. So where was I... we drove home, unloaded the repaired door and screen and installed them. The door was easy, the screen - not so much, but it is in place and useable but we will want to make some inprovements later when we figure something out. I love that the door is repaired. It is located in the room that will be my office and as there are no windows in that room, the sliding door is the only ambient light source. The room had been dark for most of the day, but having the plywood removed has made a big difference. It is now a bright room with just the daylight coming in. 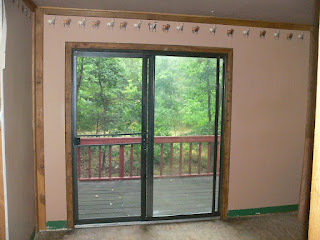 The new sliding glass door (left side of door). And it leads onto the north end of the deck. Oh, and remember why we started this morning by climbing onto the roof - to cover the chimney because if it ever rains, it would come right down the stove pipe into the living room? Well, we sat down to dinner and were watching TV (we converted DVD's of several series we like to a USB flash drive before coming down so we could watch them on Alan's tablet) and we realized it had started raining! 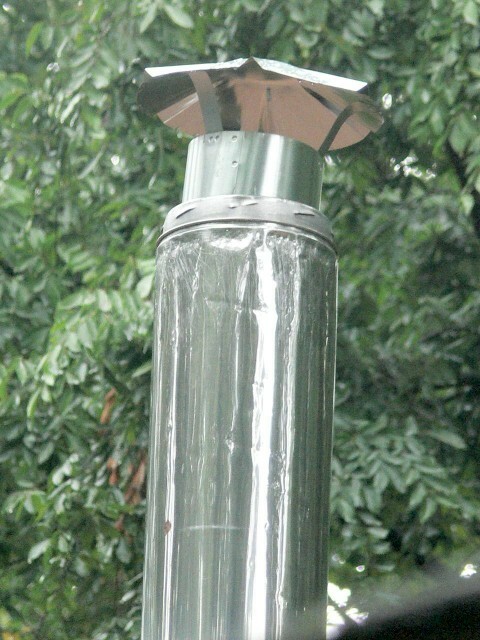 We could hear the rain 'pinging' on the new chimney cap. Unfortunately, the rain did not last long, but we were not supposed to get any until at least tomorrow night. We do not have any rain barrels or gutters in place yet for collecting rain water, but I hurried and grabbed up all our empty plastic totes that I had unpacked during this trip and placed them under the eaves along the deck. It will at least give us some toilet water. When the rain started, Alan was the first to realize that the katydids do not like rain. While listening to the rain we had a background of... silence. Since we have arrived on this trip, every night the katydids start filling the night with noise starting at about 8PM, reach full volume of over 60dB by 9 PM and keep it up into the wee hours of the morning. People said we would get used to it and we did. In fact, I couldn't fall asleep in the silence so I got back up to write this. I am not going to finish it until tomorrow because I want to take some pictures to add to it, but I have been sitting here waiting for the katydids to start up again. A few minutes ago there was a hoot owl that sounded very close to the house. We hear one most nights, be this time he was somewhere in the trees in our yard and there was another owl answering him farther down the 'holler'. Just as cell phone coverage has steadily improved over time from the initial service, which was followed by 2G (2nd Generation) and then 3G and 4G, so have our Off Grid accoutrements. Various items that were our front line necessities during our first trip have been relegated to the kitchen cupboard as second string backups during our first week back. The 'rule of thumb' for self-reliant living is to have three ways of providing the various necessities - the every day means, the fall-back method and finally the last resort should all else fail. Take for example cooking, we do not yet have our propane range, which will probably be our everyday means of cooking, but we currently use a single butane burner that will become a back-up when we do upgrade. We actually will have more than three cooking options in the future including our solar oven, gas/charcoal grill (dual compartments), Kelly Kettle for hot water and the little bio-lite stove with the USB port I blogged about a few posts ago. You will notice all of these items are for providing light. We have made great strides this week in expanding our solar system (I love calling it that) and wiring the house into the 12V batteries that solar system charges. First, we are now up to 6 solar panels. 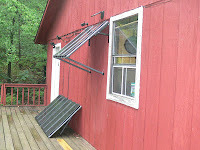 At the end of our last trip we had two panels located inside our kitchen window, we now have two 3-panel arrays on our south facing deck. We mounted the first on the wall of the house, but then realized there is actually longer sun exposure if we position them directly on the deck. Unfortunately we will now need to eventually move the first array as it casts shadows on the lower one at certain times during the day. The six panels feed into a solar connector hub which is then connected to a charge controller. The charge controller is basically a babysitter for the solar to battery connection and the battery to load (appliances) connection. If the batteries reach full capacity the charge controller stops the feed coming in from the solar panels. If the batteries become too drained, the charge controller stops the appliances from being able to draw any more power until the batteries are replenished. The batteries should not fall below 80% capacity or they will be damaged. The charge controller has also been a great source of entertainment this week. There is a display that rotates through three readings - the current charge on the batteries, the amount of charge going into the batteries from the solar panels and the load being drawn from the batteries. This may not sound exciting, but it is to us. Our bank of batteries started with their charge at 12.6, so before anything was connected to them the rotation for the read out was 12.6 - 0 - 0. We then connected the batteries into the house system so that one outlet in the utility room was 12V rather than the typical 120 found in houses. We plugged an extension cord into this outlet and took it out to the kitchen where we had a floor lamp with 12V LED bulbs (see previous post). Turn on the light and then run back to the utility room to see the display (12.6 - 0 - 0.4), doesn't that sound like great entertainment? Well, maybe you gotta be here. But wait, the excitement builds! The next morning we hook the solar panels into the system, run into the utility room and the readings are now 12.4 - 0- 0. Wait, shouldn't the second number be larger than 0 you ask? Good question, but we connected them in the morning before the sun made it over the trees so they were still in shadow. We wait impatiently for the sun/shadow line of demarcation to slowly inch it's way along the deck. Finally, a corner of one of the panels is in the sun, we run into the utility room and Bam! we now have 12.4 - 0.2 - 0. As the sun climbs, it shines on more and more of the panels, when both arrays are in total sunlight the charge going into the batteries now reads 4.0 and the current battery charge is also rising. Yesterday the current charge got all the way up to 13.1! See, I told you it was fun! Now we know the entire electrical system is working - making the power, storing the power and using the power. Time to add in more lights. To date, we have added two lights in the bathroom, one on either side of the vanity, a wall lamp in our bedroom that is turned on and off at the wall switch (whoa!) and another wall lamp in the living room. Next we hope to be able to use the existing ceiling light in the kitchen and wire it into the 12V system. We needed to get a taller ladder so we could access the attic to run the wiring as the original wiring had been ripped out. Alan has gotten sick and tired of coming across short runs of original romex wiring that go nowhere, the vandals having cut it out (for the copper?). I think I mentioned we always try to tackle our most labor intensive project of the day first thing in the morning before the temperature gets above 90. After that, we pace our activity based on the heat and humidity but we have both been pleasantly surprised at how we are tolerating the heat wave. We had individual projects yesterday morning. Alan cut up and moved the trees he had cut down while I did laundry for the first time. He had installed my utility sink, including the wringer attachment, and we had loaded up our water bottles the night before so I was ready to go. (maybe I should make it a PowerPoint presentation :-). 8 Add several inches of clean water to the utility sink for the rinse cycle. 9. Add several pieces of the washed clothes into the utility sink at a times and swish around. 12. Empty wash bucket as the water is too dirty for any re-purposing, but I used the rinse water for washing the office floor one more time - that was the room that I created mud in on the last trip when I started cleaning it. You may not believe it, but laundry day was actually fun and a big feeling of accomplishment! However, I can't imagine doing it for a large family. Kids, when you come to visit, bring enough clothes to last the trip or you will be getting lessons on laundry day.